25 P-S Lind DOCILF, site No. 25, the Department of Commerce Intermediate Landing Field, on the Portland-Spokane airway. 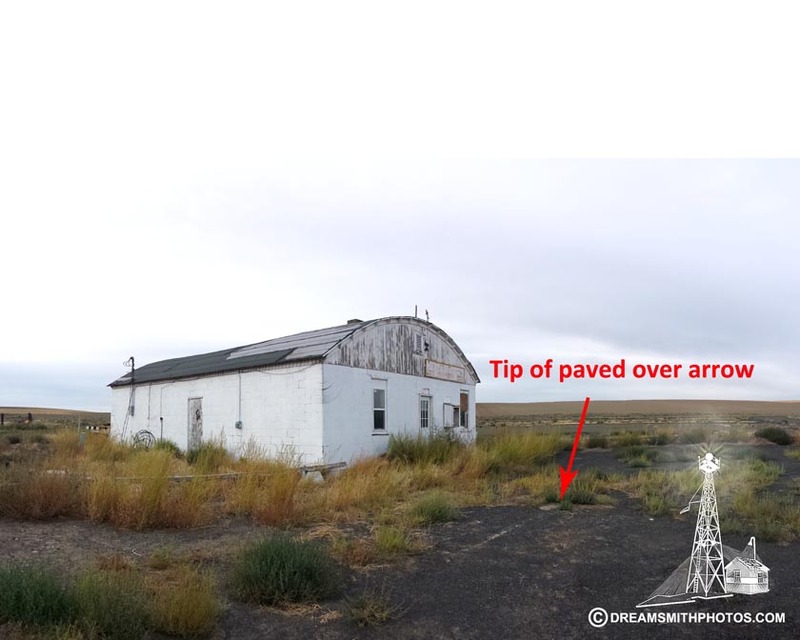 Google Earth showed an old beacon with generator shed and most of the arrow. 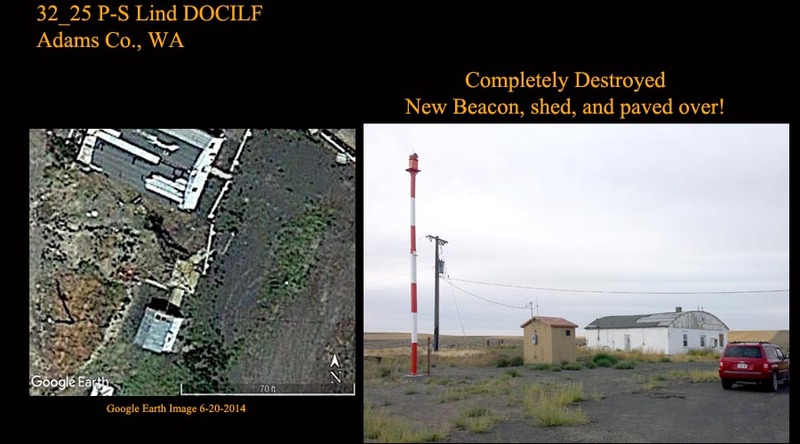 When we arrived at the site (Arrow Quest 2015), the beacon and generator shed had been removed and a new shed a beacon was in its place, little was left of the directional arrow. We were very disappointed to find this site destroyed. Portland-Spokane-This airway is being surveyed for intermediate fiels and lights by Airways Extension Superintendents S. S. Boggs and Grant N. Berryman. The Pasco-Spokane section will closely follow the highway and railroad leading from Pasco to Spokane, and the intermediate filed sites will be located at Connell, Lind, Cheney, and an intermediate field midway between Ritzville and Sprague. Lind, Wash. (P-S Site No. 25).— The dimensions of the intermediate landing field located 1 mile east of the town of Lind is approximately 2,000 feet square, and not 2,000 square feet as stated in a previous notice. Lind.—Department of Commerce intermediate field, site 25, Portland-Spokane Airway. One mile E. Altitude, 1,361 feet. Irregular shape, 60 acres, 2,025 by 1,761 feet, sod, level, natural drainage. Directional arrow marked "25 P-S." Pole line to S. and SW., beacon tower to SW. Beacon and boundary lights. Beacon, 24 inch rotating, with green course lights flashing characteristic "5" ( . _ .). Aviation fuel, day and night. No other servicing facilities. Lind.—Department of Commerce intermediate field, site 25, Portland-Spokane- Airway. One and one half miles E. Altitude, 1,361 feet. Irregular, 2,025 by 1,761 feet, sod, level, natural drainage; entire field available. Power shed marked "25 P-S." Pole line to S. and SW.; beacon tower to SW. Beacon and boundary and approach lights. Beacon, 24 inch rotating, with green course lights flashing characteristic "5" ( . _ .). Aviation fuel, day and night. Portland-Spokane airway. Pasco-Spokane section: All lights along this airway are operated from dusk to 1 a.m. sites nos. 22, 25, 28, and 31, intermediate landing fields located at Donnell, Lind, Sprague, and Cheney, Wash., respectively, are described in Airway Bulletin No. 2. The strip map covering this section of the airway is published on page 46 of Airway Bulletin No. 1. Lind.—Department of Commerce Intermediate field, site 25, Portland-Spokane Airway. One and one-half miles E. Altitude 1,478 feet. Irregular, 2,025 by 1.761 feet, sod, level, natural drainage; entire field available. Power shed marked "25 P-S." Pole line to S. and SW.; beacon tower to SW. Beacon, 24 inch rotating, with green course lights flashing characteristic "5" ( . _ .). Aviation fuel, day and night. Lind.—Department of Commerce intermediate field, site 25, Portland-Spokane Airway (day field only). One and one-half mile E. Lat 46°59'; long. 118°35'. Alt. 1,478 feet. Irregular, 2,025 by 1,761 feet, sod, level, natural drainage; entire field available. Power shed marked "25 P-S." Pole line to S. and SW; beacon tower to SW. No servicing.